Many travelers view hotel rooms as their "safe place" while traveling away from home. However, tourists and business travelers are prime targets for scam artists; and the hotel medium provides an easy path to achieve the goal of separating a traveler from their cash. Even the savviest world travelers can get caught in the midst of sophisticated hotel scams, proving that you can't let down your guard. But spotting a slimy hotel scam takes more than just an inkling. Avoid hotel rackets entirely with a little know-how of what to be aware of before you go. This way, you can worry less about losing your identity, and instead focus on having a great trip. It's not uncommon to find a number of local restaurant menus in a given hotel room. And while dining in feels like the safest bet, ordering from one of these menus might make you the brunt of swindle. Here's how the scam works: The scam artist creates and prints realistic food menus. Once created, the documents are slid underneath the doors of hotel rooms, inviting guests to place an order. During the call, travelers are often asked to pay with a credit card. In the end, the food never comes, and the scam artist gains access to the guest's credit card information. To avoid this, research the restaurant's phone number before you order to make sure the one listed is authentic and you're not ordering from a restaurant that doesn't exist. A simple internet search of restaurants in the area will yield plenty of dining options. And those who have doubts can always ask the front desk or concierge for restaurant recommendations. 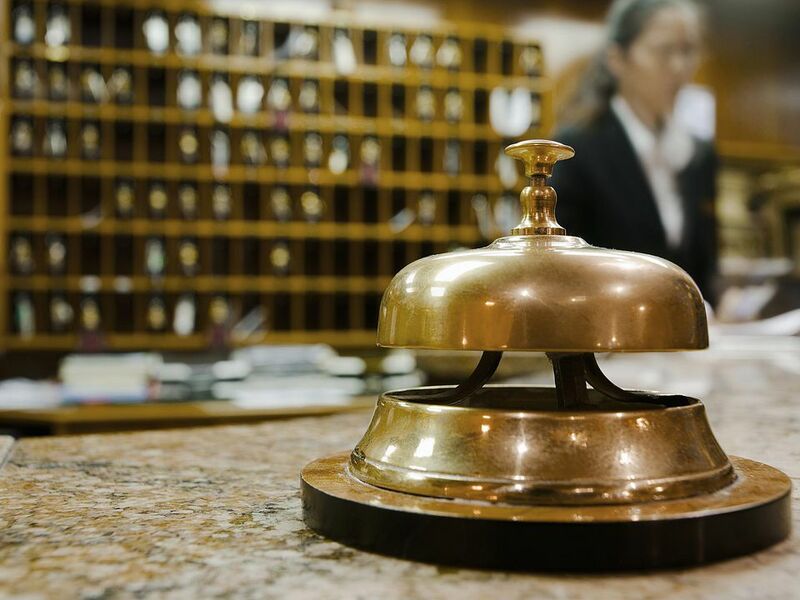 In many high-end hotels, personnel are trained to phone a guest's room 15 minutes after check-in to make sure that their accommodations are suitable. But smart scammers know that an unsuspecting traveler can be taken advantage of with this simple "courtesy call." This front desk call scam can especially be a problem in developing parts in the world. And it goes something like this: A traveler receives a phone call from someone claiming to be a hotel front desk employee. Oftentimes, they mention that the credit card on hold was declined and they need to re-verify the payment method. As a convenience to the guest, they offer to take the credit card information over the phone. But, real hotel personnel will never ask for credit card information over the phone, so don't give the calling party anything. Instead, offer to come down to the front desk to sort it out. If the caller insists that the issue must be taken care of immediately, simply hang up and contact the front desk to report the incident. Nobody enjoys paying for internet access at a hotel. This makes a "free Wi-Fi" network tempting for travelers wanting access to the outside world. However, wireless internet "skimming" is a growing hotel scam that targets guests with the promise of free internet access. Common mostly in the public areas of the hotel, the scam works by allowing a "free" internet hotspot (often named "free Wi-Fi" or something similar) to be accessed by your computer. Once connected, your data then routes through several points, including a scam artist's computer. Because the scammer controls the connection, they can collect all the data a traveler transmits, including (but not limited to) websites, usernames, and passwords. Before connecting to any network while traveling, make sure it's a secure connection. Many secure hotel Wi-Fi connections offer a two-step verification process that requires you to enter a password. Other secure networks list the name of the property or hotel chain in the network ID and advertise their wireless network on printed hotel materials. Be sure to ask the front desk which preferred network you should connect to and how to access it once you're on the property.